Meinl Byzance Series Spectrum Ride 22"
If you like your cymbals clean and bright, then you will probably give the Extra Drys a wide berth on appearance alone. If, however, you look for character and complexity in a cymbal then you will not be disappointed - they're like sampling vintage stilton after mild cheddar. The Spectrum ride is no less musical but is undoubtedly more versatile, and Meinl and Rodney Holmes deserve credit for creating such a wonderful cymbal. The Extra Drys are a very distinctive set of cymbals that ooze individuality, and the Spectrum ride is a class act. Some drummers might baulk at their appearance – judge with your ears! Meinl's Byzance range was created to evoke the warm, rich tones of vintage cymbals. It has since evolved into several distinctive lines. The first is the Extra Drys, along with another new cymbal, a 22" Spectrum Ride from the Byzance Dark range, developed with the assistance of Rodney Holmes. The Byzance Extra Dry range comprises five models - 14" hi-hats, 16" and 18" crashes and 20" and 22" rides. Byzance cymbals are individually cast from B20 bronze and hand-hammered. Once the cymbalsmiths are satisfied, the cymbals are transported to Meinl's headquarters in Germany for finishing. There, the more regular Byzance cymbals are lathed and then buffed or polished, but while the Extra Dry hi-hats and crashes are lathed underneath, the similarities end there. These cymbals have a distressed appearance, pockmarked with countless hammer marks. While bearing traits of a pattern, the hammering is not uniform. There are areas of increased activity, as though an insect landed on a cymbal mid-hammering and it took the cymbalsmith a few blows to squash it! In contrast, the bells on each cymbal have been spared the cymbalsmith's attention. The finish could best be described as rustic - the cymbals are left untreated and the natural discolouring from heat treatment and metal ageing has not been corrected. Even the logos are partially submerged beneath the combination of pits and oxides. The results will probably polarise players; it's a love-it-or-hate-it thing. The 14" hi-hats partner a light top cymbal with a heavy bottom. First impressions are of a fairly thick and sloshy sounding pair of hats. There is an element of top end to them, but none of the usual high frequencies, so they sound full and meaty, even when played quietly. Relaxing the pedal finds them accelerating to a dark, frothy wash and stepping brings about a fat, positive chick. These hats possess bags of tonal individuality along with the power to be heard. The two crashes are fairly thin and, holding them, you get a real sense of how uneven their surfaces are. The 16" crash opens quickly, almost to the point of being abrupt. It has a dark, slightly trashy, but an overall sweet tone. The note that remains decays fairly swiftly, merging harmoniously with any overtones. The 18" crash takes things up several gears. It is extremely dark, markedly loud and very trashy. Pitched somewhere between a crash and a china, it erupts with sizzling energy. The bell is fairly useable as well. Attacking it with a mallet causes it to swell magnificently, bringing all of its raw tonality to crescendo. Unlike the hi-hats and crashes, both of the Extra Dry rides are completely unlathed. They have been hammered from above and below, but not been subjected to any further processes that could compromise the cymbalsmith's realisation. The 20" model is understandably dry - it has a dark, low tone that is full of complexity. The stick sound it delivers is well separated from the main body, and is strong and distinct. A near-total lack of wash ensures that patterns are reproduced eloquently. The 22" ride is again extremely dry and darker still. While the stick sound is even more pronounced, the body smoulders with exotic warmth. Warming it with a mallet brings gong-like convolutions to the fore. Both of the rides' bells are very cutting. The 22" Spectrum ride, which is Rodney Holmes' new signature cymbal in everything but name, is less extreme than the Extra Dry models. Rodney wanted a ride capable of transcending genres. Available only in 22", it is at the heavy end of medium weight. It has a fair collection of hammer marks and a spiral lathing pattern travels all the way from the centre hole to the edge on both sides of the cymbal. The wide spaces between each band of lathing have been left untreated, making for striking visuals. In use, the Spectrum ride seems to have captured the qualities Rodney was seeking. It produces a warm, dark, but clear ping over an almost-perfect spread of wash. Going up onto the bell, the sound hardens and increases in volume, but not at the expense of its tone. The bell really feels like a part of the same cymbal (which is so often not the case). This is an impressive ride, full of colour and dynamics, and it's hard to imagine a musical setting that it couldn't thrive in. 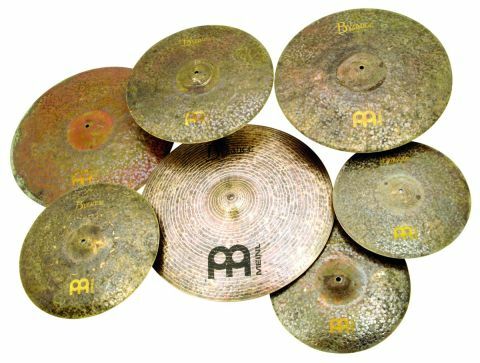 Meinl seem to be unfairly regarded as a manufacturer of mainly rockers' cymbals. The Byzance range is proof that the company caters for a far wider audience. These cymbals are fabulous examples of old school cymbal smithery. Whether or not they will appeal to you is more down to your taste in cymbals than your musical persuasion.